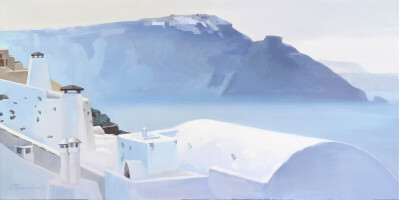 The artist creates his Santorini paintings-impressions as if he uses the "white noise" to paint... We could imagine that he picks it from space, densely mixes it with a paint and this noise precipitates on the canvas... repeating as if the ritual action of the Santorini's builders... the "white noise" tamers. 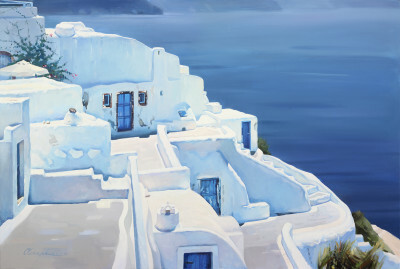 This way the meditative impressions from Santorini, embodied by Sergiy Oleksyuk (Oleksiuk) in paintings, are described. The artist was born in 1961 in the city of Kolomyia (Ukraine), studied at the art school in Vyzhnytsya, Chernivtsi region (Ukraine). In 1993 he graduated from the Kyiv Art Institute (now the National Academy of Fine Arts and Architecture of Ukraine - NAFAA) - the Department of Painting, Theater and Decorative art. While studying, Oleksyuk participated in national and all-union exhibitions in the Kyiv exhibition halls and galleries, later his works were exhibited in Kyiv also at international exhibitions. Immediately after the end of NAFAA, the first personal exhibition of the artist took place in the American State College in the library of the local university. 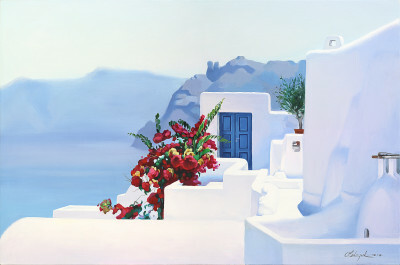 At the moment, the artist has over 30 years of art practice in various techniques and styles. Sergiy Oleksyuk works in oil, acrylic and watercolor painting, creates artworks in pencil, charcoal, sanguine and many other materials. Has great experience in working with portraits, photography, genre paintings and landscapes. 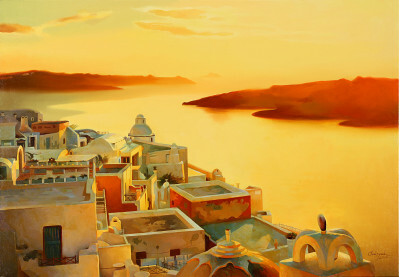 Since 2000 to 2010, Sergiy lived and worked in Greece on the island of Santorini, his original landscapes were exhibited in local galleries and travelled across many countries. 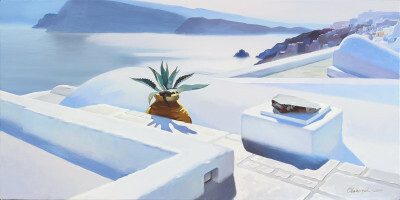 Santorini's meditative landscapes are especially appreciated by adherents of the painting practice of the master. Sergiy is seriously interested in photography, participated in international photo exhibitions. 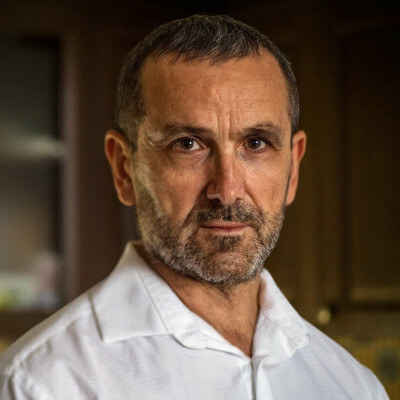 Oleksyuk is fascinated by contemporary art, works with installations and techniques of abstract painting. In 2013, in the gallery TSEKH (Kyiv, Ukraine), a personal exhibition of works by Oleksyuk "Space vs Plane" was held. In 2015, the artist's works took part in a charity auction from the KORNERS auction house (Kyiv). 2016 - a group exhibition "Leap to Europe" in the gallery TSEKH (Vilnius, Lithuania). Artworks by Sergiy Oleksyuk are in private collections in Ukraine, European countries, USA, Canada and Australia.